Looking for a capable little blue water cruiser? This is one of the biggest 30ft cruisers available, along with having the ability to sail her way out of almost any tight spot and through most weather situations. Although she has the space, she is not a floating caravan. Her modern underbody gives her well proven sailing abilities for fast and safe passages to or from whatever places you choose to visit. Windward passages don't mean resorting to the iron tops'l, she takes them in her stride. At the other extreme, she is shallow enough to access most canal systems. These features make her a very versatile cruiser. She was commissioned to extend the bottom end of my HOUT BAY range of gaff rigged steel yacht designs and has since been drawn in a marconi cutter version as well. She is aimed at the smaller end of the steel cruising boat market with emphasis placed on ease and economy of construction. Construction ease comes from a single radiused chine shape which produces a round bilge hull which can be readily built by a competent amateur. This is combined with a raised sheer/flush deck configuration for simplified deck construction and large interior volume or a conventional trunk cabin configuration for aesthetics and reduced windage. The interior accommodation is very roomy and comfortable, with the head moved aft from it's traditional forward position to alongside the companionway. The result is a layout in which a small crew is fully catered for aft of the mast, not having to spend much time in the bow areas if sailing to windward in bad weather. Designed to be cruised with one to three persons on board, she has six berths. 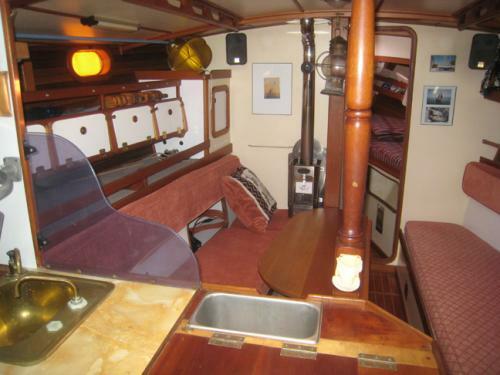 These are a pair of V-berths in the forecabin, port pilot berth and starboard settee berth in the saloon and a double quarter berth with dividing lee cloth opposite the head. 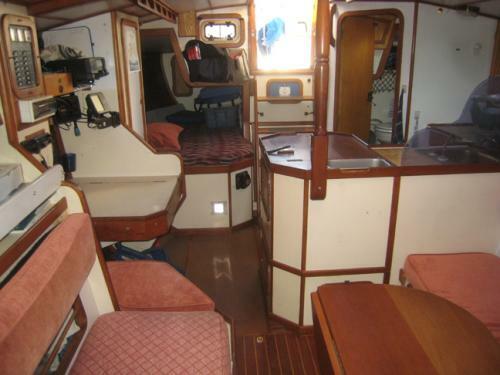 The navigation table faces aft with the aft end of the settee berth forming the navigator's seat. The engine is under the galley sinks with good access all round and has a very short shaft which exits from the keel trailing edge. Construction is frameless using longitudinal stringers to support the 3mm hull and deck plating. The stringers are in turn supported by welded on tabs bolted to 13mm plywood bulkheads and semi-bulkheads. The gaff sail plan is bald headed gaff cutter for general sailing and uses a steel sealed tube for the mast section. For those wanting light air performance a gaff topsail can be set on an unstayed sprit topmast hoisted with the topsail. The marconi cutter rig uses a double spreader aluminium spar and a shorter bowsprit than that used for the gaff rig. The marconi cutter rig has the edge to windward but the gaff cutter, when combined with an efficient underbody such as this, is no slouch on that point of sail either. In essence, the Hout Bay 30 is intended as a minimum investment cruiser without sacrifice in strength and seaworthiness. She is a "go anywhere" cruiser for the sailor with a limited budget. For a larger boat in this concept, see the Hout Bay 33. Testimonial from Corrie de Jongh - owner of gaff rigged Hout Bay 30 "Anne M", writing to the Traditional Boat Association midway through his voyage from Cape Town to Europe and back. In summing up, I can only congratulate Dudley Dix on designing one of the finest and strongest thirty foot cruising yachts I've ever sailed in, lots of space and sensible layout, easy to maintian and most important, dry. On the whole trip I never had to get into a damp sleeping bag, and the biggest plus point, "Anne M" was always able to look after herself when things got tough. 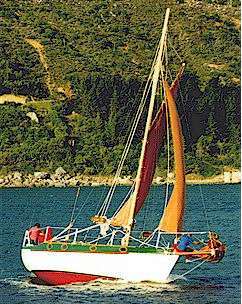 The gaff rig, once you get to understand it, is a fine cruising rig, even when sailing solo I never had any problem handling the rig. Reefing, provided you don't wait too long, is no more difficult than a Bermudan rig, just a few more strings to pull. When sailing solo I always put two, even three reefs in the main before dark, I hate reefing at night. Under triple reefed main and staysail she can handle almost anything except the very worst. Interior of flush deck version of Hout Bay 30.